Holmgren, Eric J.. "Camrose". The Canadian Encyclopedia, 09 May 2016, Historica Canada. 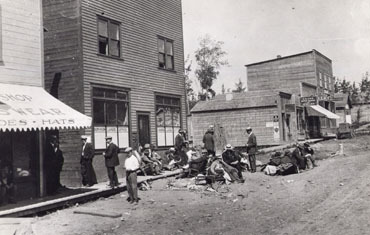 https://www.thecanadianencyclopedia.ca/en/article/camrose. Accessed 22 April 2019. Camrose, Alta, incorporated as a city in 1955, population 17 286 (2011c), 15 630 (2006c). The City of Camrose, located 97 km southeast of Edmonton, is a distributing, medical, government and manufacturing centre for a rich, mixed-farming area. Camrose, Alta, incorporated as a city in 1955, population 17 286 (2011c), 15 630 (2006c). 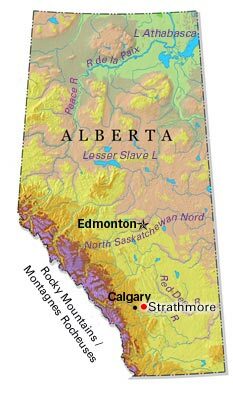 The City of Camrose, located 97 km southeast of Edmonton, is a distributing, medical, government and manufacturing centre for a rich, mixed-farming area. François Adam, a Belgian who came to the Duhamel mission in 1886, was responsible for the founding of the town in 1905. Initially called Sparling, Camrose is named for a town in Wales, but the name may also refer to the wild roses that grow along Stoney Cr, which flows through the town. The area was settled in the early 1900s, mostly by Scandinavians, whose influence remains in the Augustana University College, a degree status university, the Garder Bible College and the Camrose Lutheran Bible College. One of Canada's first ski clubs was formed here in 1911. The city is served by both CNR and CPR, has 2 weekly publications, The Camrose Canadian andThe Camrose Booster, and a giant country and western radio station. Early history of Camrose, Alberta and districtOnline digitized version of a 1947 Camrose Historical Society publication about the history of Camrose, Alberta. From the Our Roots website.